Writing a resume is hard. Yet even today, most job applications require resumes to be considered for a position. The true goal behind a resume is to market yourself. You are your best advocate. You must create a resume that can advocate for you even when compared with many other qualified candidates. If you are a college graduate, it’s not necessary to list your high school experience. If you have attended a bootcamp but do not possess a college degree, you can include your high school information. If you have studied abroad, you’re welcome to add this information beneath your main degree program (if space permits). Any college degree should be listed in reverse chronological order (Ph.D, M.S., B.S.). You can add contact details to the footer of your resume, but they must be present in the body of the document as well. You may also choose to include links to social media or networking sites such as LinkedIn, GitHub, CodePen, and more. Just ensure they’re done in an appropriate manner and don’t take away from the main content. Steer away from including sites that do not have a lot of information or substance to them. Personal portfolio/blog/social media/GitHub, etc. (where applicable and relevant). This is one of the most vital sections on a resume. If you’re just graduating high school or college and have no relevant work experience, you can include one to two jobs which indicate your employment history. It’s best to list work experience which exemplifies the industry you wish to be part of. Internships are a great way to get some work experience and I highly recommend this for people who are new to the industry. If you don’t have the means or ability to obtain relevant work experience, include projects you have worked on which showcase your skillset. Freelance work is also a great way to get some experience. 1–2 sentences, or bullet points, stating what you were responsible for. These should be specific examples of contributions you made. Stay away from generic filler text. Use positive language such as achieved, influenced, mentored, and launched. The skills section is the second most important section on a resume. Its primary concern is listing all of your technical and non-technical capabilities. Personally, I believe you should leave off skills similar to“Microsoft Word”, “Keynote”, and “Mac OS”. These skills are quite standard and can make it appear as though you’re trying to fill space on your resume. Instead, showcase the skills you’re proud of and which differentiate you from the competition. Do not list skills which you would not be comfortable answering questions about on a technical interview. I have made this mistake myself, but potential employers are free to ask you questions regarding any skill listed on your resume. If you created a small pet project using PHP back in 2011, but forgot all the necessary skills, don’t list it. I personally find a personal statement to be outdated. In prior years it was standard to include an objective, but the standards for resumes have relaxed a bit in recent years. You are welcome to add a personal note or objective, but I don’t find it necessary. I tend to leave references off of my resume. If a potential employer requires references, they will ask you. Thus, I save the space and leave them off. Awards and certifications are great things to add (if you have the space). If you have a lot of these, narrow them down to the top five which best represent your work or character. Additionally, adding some of your personality into your resume can go a long way to differentiating you from the crowd. We’re spoiled by the informal nature of the tech industry, so our resumes can leverage a bit more creative license. By incorporating small colloquialisms and designs into our resume, you show the hiring manager or recruiter who you are. It’s important to put love and effort into your resume as this can indicate to the employer your attention to detail. Unless you have ten or more years in the relevant industry, your resume should be no longer than one page. 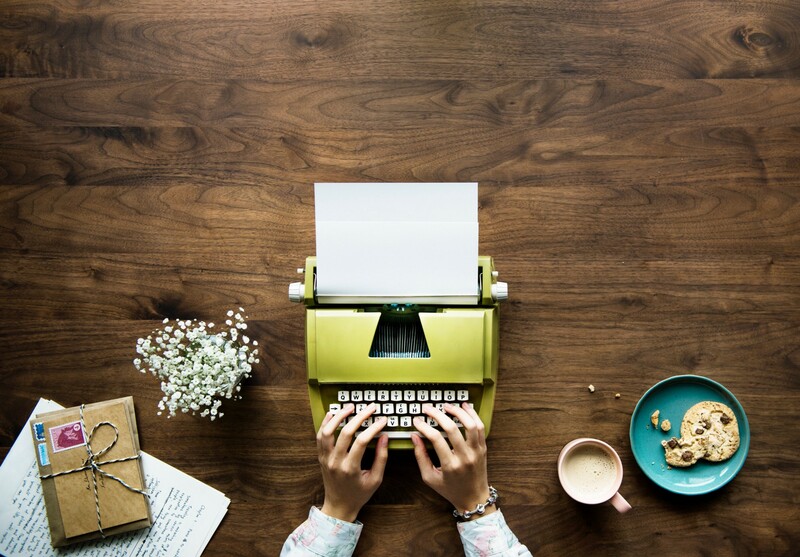 Often, recruiters will glance at the first page of your resume and throw it aside if they don’t immediately see something worth a deeper look. You have once chance to make a good and unique first impression. Do not list every single skill or technology you’ve ever acquired. If you don’t currently possess it, don’t list it. It could lead to some awkward conversations in an interview. You have at most two pages to convince an employer they should at the very least interview you. Thus, it’s important to be selective about what bits of information you share. Additionally, you want to leave room for some intrigue. If you list everything about yourself on your resume, there’s nothing left for the employer to ask you about. There is nothing worse than a resume with spelling and grammatical errors. To combat this have two or three people review your resume. Ask them what their first impression is at first glance. Many programs include spell check; use it. Be selective and consistent with your font choices and ratios. Do not choose “fun” or difficult to read font. Stick with a serif or sans-serif font. Use at most two font families. Your font should be no smaller than ten pixels. Ensure you are consistent with spacing. This can have a major impact on the clarity and visual attractiveness of your resume. There are many programs you can use to create your resume. Most applications require a .doc, .docx, or .pdf format, so ensure the program you select can export to these file types. I highly recommend first creating a bare-bones resume with the content as the main focus. 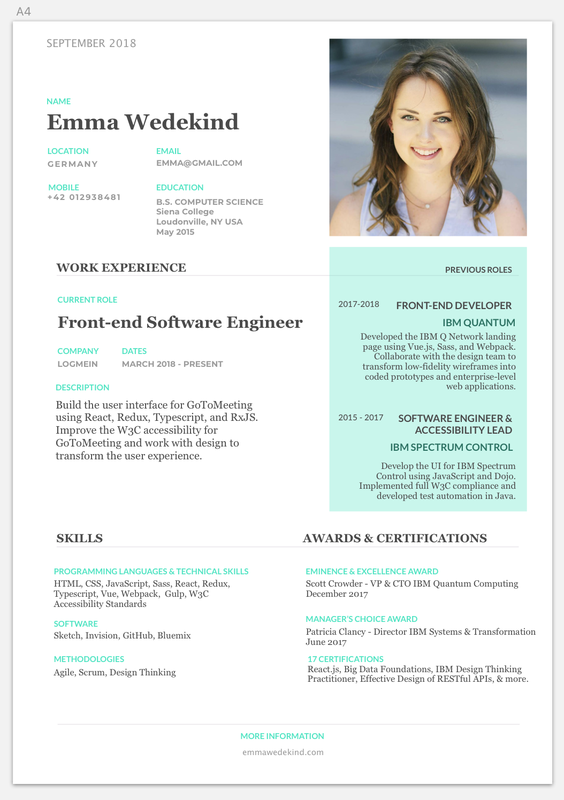 “Pretty” resumes are wonderful, but are only effective if the content stacks up. 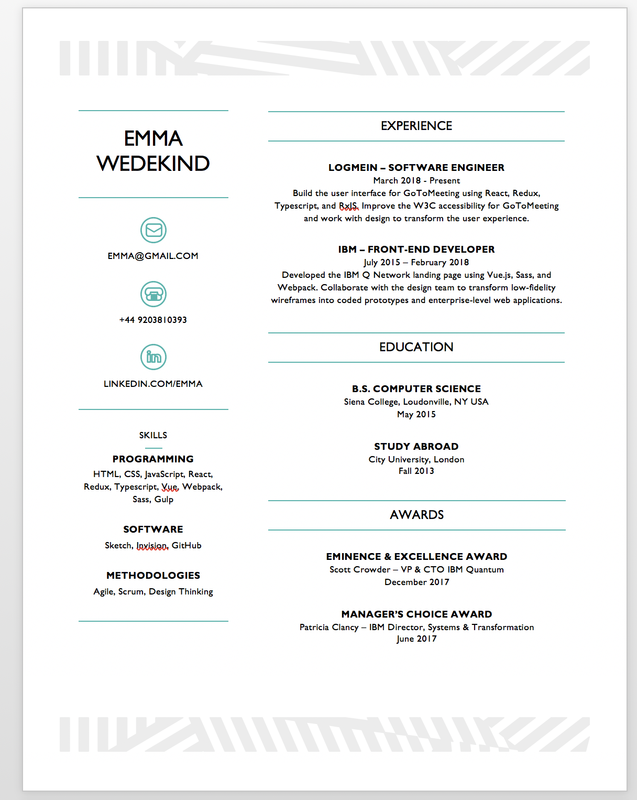 Here is what an example “basic” resume might look like. I created this using a Microsoft Word template. This is a great first step towards creating an awesome resume. The focus of this version should be the content. You may choose to use this as your final product, and that’s fine. But adding a few visual enhancements will greatly improve your ability to stand out. Now it’s time to add some visual flair. I prefer to use Sketch to create beautiful graphics and designs. You can download a free version and find some awesome YouTube tutorials to get started. You can also create custom resumes using Google Docs or Microsoft Office, but it might take a bit longer. I tend to stick to one or two colors. Nothing too bright or abrasive. It’s not a necessity to include a photo. I tend to select a photo which matches my social media accounts and LinkedIn so I am easily identifiable. By creating a beautiful resume, you’re likely to stand out from the crowd. Both of the resumes can be downloaded below. Feel free to customize them to your liking! By leveraging these tips, you’re bound to create a stand-out technical resume. It’s important to always keep your resume relevant as your skills, work experience, and education changes. Good luck and feel free to reach out on Twitter if you have any questions!